Powder rooms, also known as half-baths, are rooms with a vanity/sink and a toilet, and usually no shower or tub. They are practical spaces for larger homes and apartments, but they are often seen as just that: practical. Because they are small, we usually don't think about them in terms of decor. But we should. 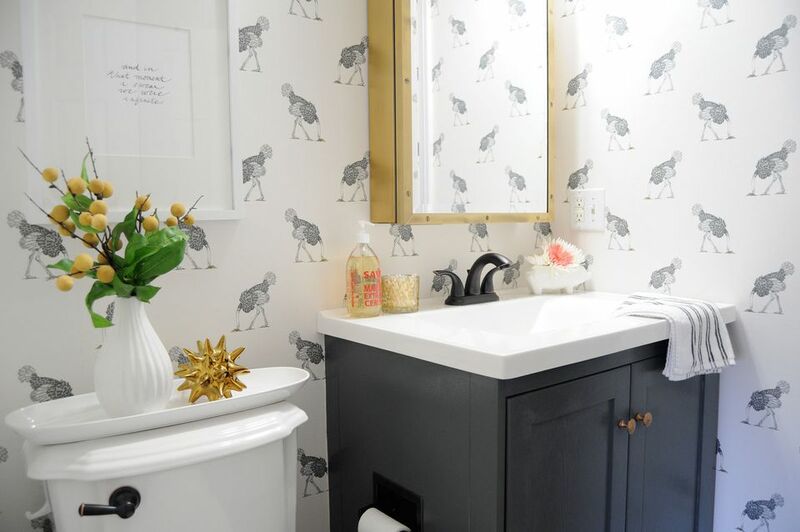 You can pack a lot of design punch in even the smallest of powder rooms. Want to feel inspired? Here are some examples of beautifully decorated powder rooms in a variety of styles. This simple, clean powder room features the best of three worlds: white shiplap wall paneling for the beach, a brass framed mirror for modern, and a retro sink for a farmhouse. Even though these three styles don't usually come together, it works really well in this space by NUMI Home LLC because every element is balanced. If you feel your walls are a little dull, try something unexpected, like this wiry frame mirror. Maybe it'll give your powder room the "oomph" it needs. The basis of this vintage look by Christopher Architect is the repurposed console table, made into a washstand. The drawer could hold a few extra washcloths and soap. The wall-mounted sink is also vintage and uses straight lines that balance the curves of the vessel sink. The carriage-style light fixture really brings everything together, though. It's a daring choice, but it balances the shape and volume of the round window. This gorgeous powder room from Jessica Conner features a lantern-style cement tile with a slightly thicker grout line, dark brass hardware, and vertical light fixtures. The focus on soft, curvy shapes is what makes this space feel so feminine. Note the floating limestone washstand, which opens up the face and displays the bottom plumbing (also in dark brass). Limestone is a beautiful material with a soft texture, both visually and to the touch. They may be small, but powder rooms don't have to be all white and grey and soft colors. This bold royal blue powder room by Baxt Ingui Architects, via Houzz, is a great example. The wall paneling adds some texture and movement, and the traditional tile and wood/marble combination vanity will resist the test of time and fashion. But the blue is, obviously, what makes the space here. High-tank toilets are making a comeback. In this simple, clean retro powder room by Lisa Gutow, the tank is set way up on the wall to make maximum use of space. This simple trick changes everything: the powder room now seems spacious and open, rather than cramped. Shiplap wall paneling adds a touch of the beach house that makes the whole welcoming and warm. This powder room, designed by Peter Dolkas, shows that you can do a lot with a little. Who needs a vanity? Just set an antique marble basin on a small shelf and a pedestal table on the side for soaps and such. The room suddenly opens up, and the small powder room now seems like a luxurious spa space. Warm, dark wood and cool white balance each other perfectly. There's a whiff of 60s modern decor in this elegant powder room by Robert A. Cardello Architects, via Houzz. The large drawer handles set on a brown background and the stainless steel vanity frame are the basis for this impression. But the beveled mirror takes more from the 50s, along with the crushed velvet-like effect on the left wall. But the two decades don't clash here; they seamlessly flow into each other to create a unique yet familiar look. The faded pattern of this wallpaper makes it less overwhelming. The simple, modern pedestal sink almost disappears against the background in this powder room by Sarah Wittenbraker, while the contrasting brass mirror frame and sink hardware pop right out. All in straight lines, this powder room feels strong and vivacious. This unabashedly modern powder room by Gordon Weima, via HomeAdore, plays with volume and space with a really interesting asymmetric washstand. The sink is embedded in the marble slab, but it only covers a part of the countertop. This increases the sense of depth and space, and has a stacked, minimalist effect. Enhanced by the leafy wallpaper and brass hardware, this gorgeous powder room is full of energy.